This post and episode are sponsored by our friends over at Maytag®. I received compensation and only partner with brands I truly believe in. 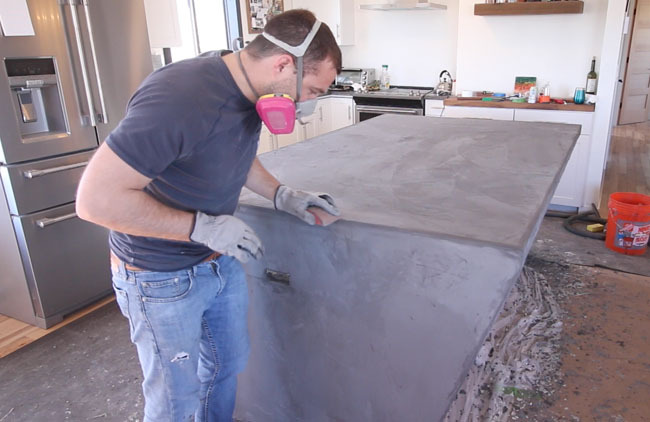 I'm excited to share a new project with you that involves concrete! Over the past few months I've been renovating my home near Bozeman, Montana. I love to entertain friends and family, so having a large kitchen island and open floor plan was a must. 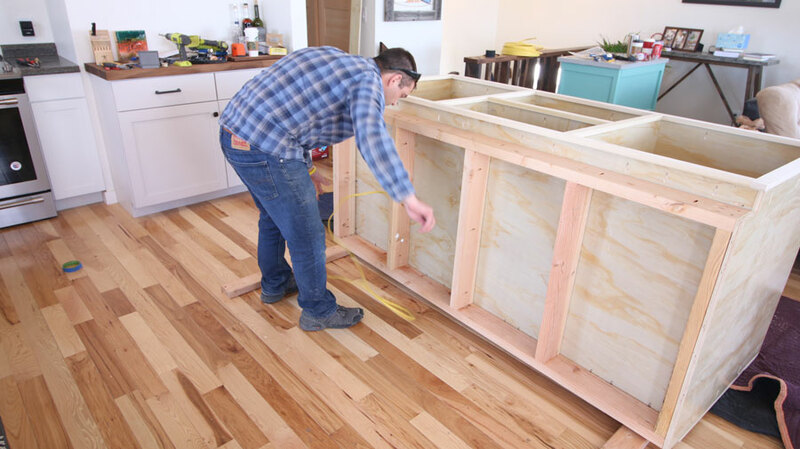 After watching a few episodes of Fixer Upper on HGTV, I was inspired to build a concrete counter with waterfall edges. 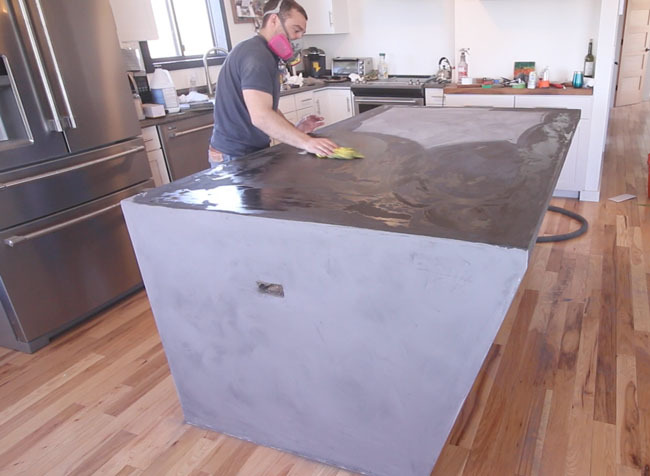 At 2 inches thick, I calculated the weight of a solid concrete countertop with side panels to be approximately 1100 pounds. This would have been a lot of stress on my new hardwood floor with a basement below. So, I researched a few options and decided to go with a durable, yet light weight concrete overlay material. The final result came out amazing and it has become a talking point of the home. The concrete pairs great with the cabinets. Plus, it ties in perfectly with the new Maytag appliances! I love the entire suite: fridge, stove, hood, microwave. If you are in the market for new appliances I would highly recommend checking out what Maytag has to offer! Especially since May is Maytag Month. The brand is offering powerful deals from May 3 - June 6 on kitchen and laundry appliances, so make sure to visit here for more details. Concrete overlays have been around for a long time. They are very durable and are often used in high-traffic outdoor areas for stamping concrete and adding a new finish to existing concrete. A few companies, including Concrete Coatings and EliteCrete, make concrete overlays. I actually went to an in-depth three day training to learn how to use these products and went on to run a decorative concrete business a number of years ago. 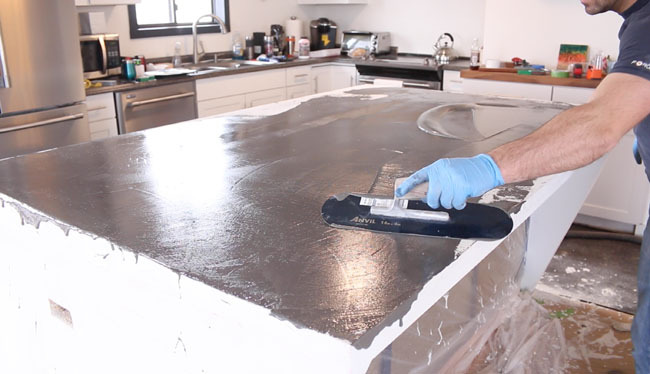 I've seen a few folks do similar counters using Ardex, which is an underlay material that is not meant to hold up against water and everyday use. Overlays are much more durable. I've been using the counter a few months and it has held up great. I'll be updating you a year from now to let you know what I think of it! Enough backstory, let's get to the project! 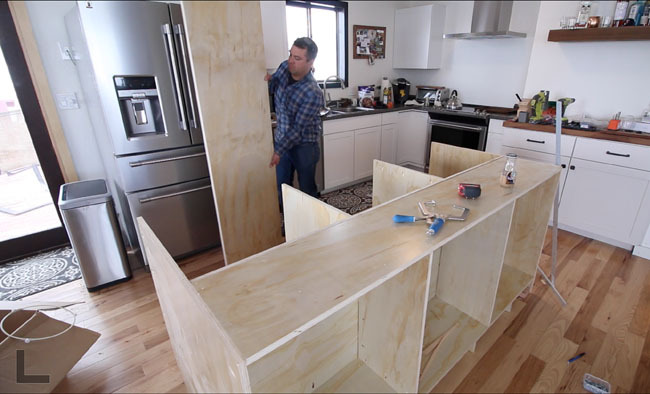 We'll start by creating the base cabinets. I'm going to do a simple overview of the process since it is a very custom project. I think you'll be able to learn the basics of how to build this so you could create something similar. 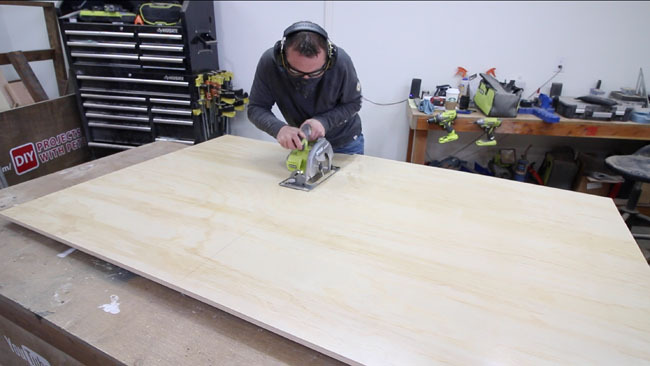 I cut the panels using a table saw and circular saw. One side is full of drawers and has our Maytag microwave in the center. The other side consists of doors and shelves. Here is a look at the more sturdy base I added later on in the build. I ripped 2x6 boards down to size on a table saw. This adds a lot more strength to the base. Route the electrical if you want to have any outlets or other appliances in your island. If you are not comfortable doing electrical, be sure to consult with an electrician. Add dividers to split up the two sides. I added additional dividers on each side. 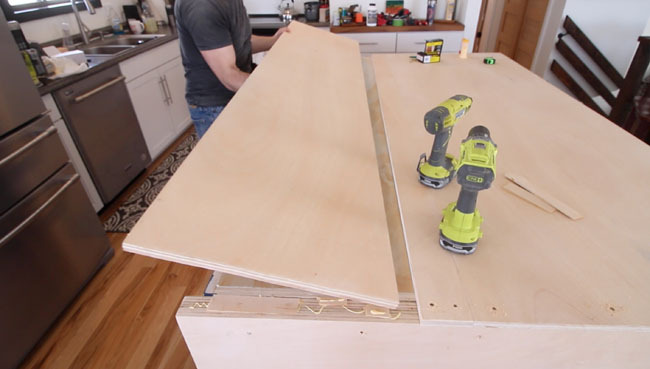 Construct the face frame for both sides of the island. We made ours using 1x2 boards. Because of the concrete waterfall top, the face frame should be flush with the edges on all sides except the bottom which should have an overhang. Attach the face frame using pocket holes from the sides, top, dividers and underside so it is firmly in place. The toe kicks may get in the way like they did for us so you might need to remove them to attach the face frames. 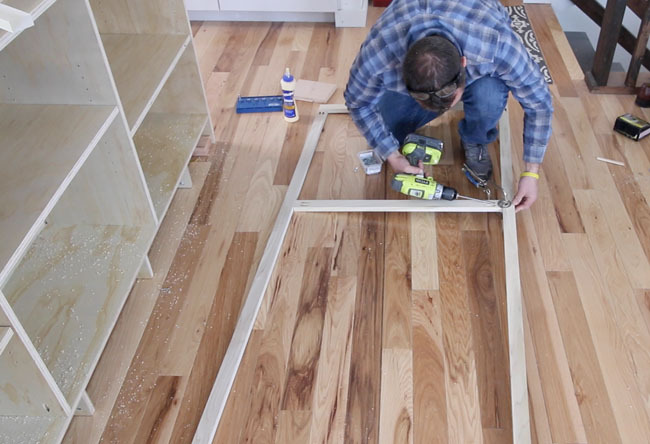 Determine the sizing for your doors and drawers. I cut scrap plywood to size that lined up flush with the face frame. This is used to mount the drawer slides to. 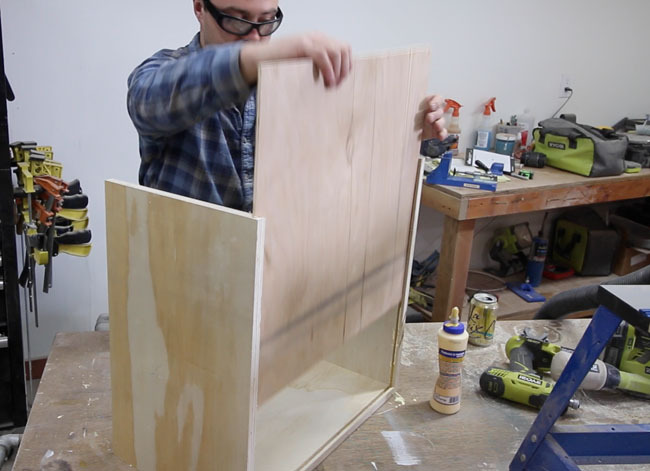 To construct your drawers, cut the sides to the proper height. Next, cut a 1/4" slot that is 1/4" up in each of them. 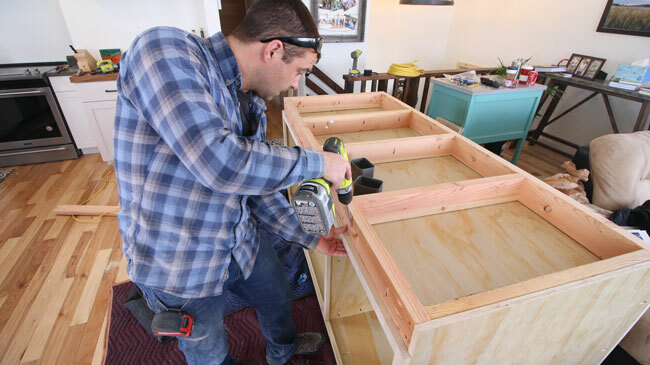 Fill the slots with glue, slide the drawer bottom in and tie it all together with pocket holes on the front and back, both of which will be hidden. To construct the doors cut 1x4 boards down to size for the vertical rails and horizontal stiles. Similar to the drawers, cut a 1/4" groove 1/4" up in all the stiles. Second, cut a 1/4" rabbet in the horizontal stiles so it will all lock together. Then glue and clamp until dry. 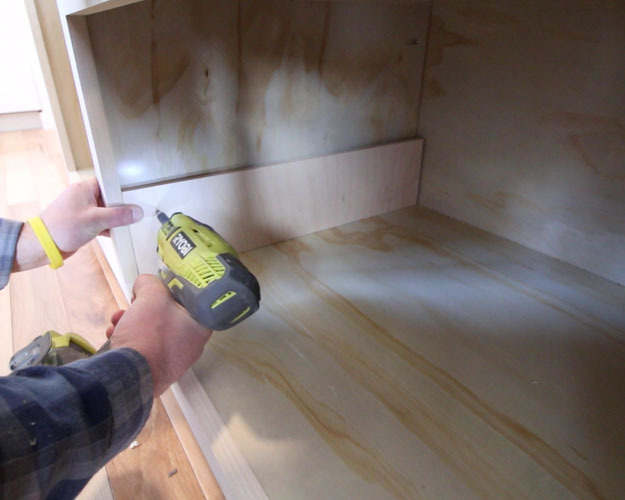 Mount the drawers and slides, then place in the cabinet. 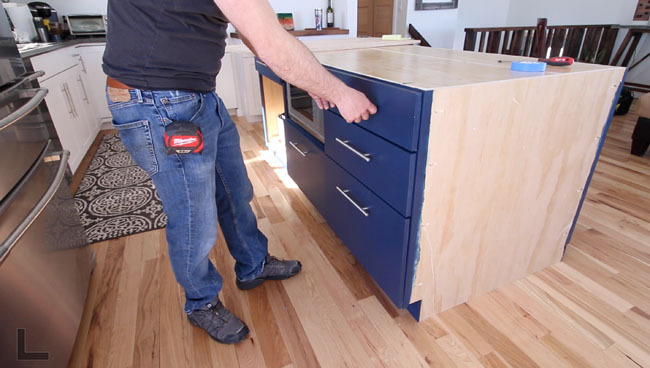 For more detailed instructions on how to do this please see the base cabinet video. 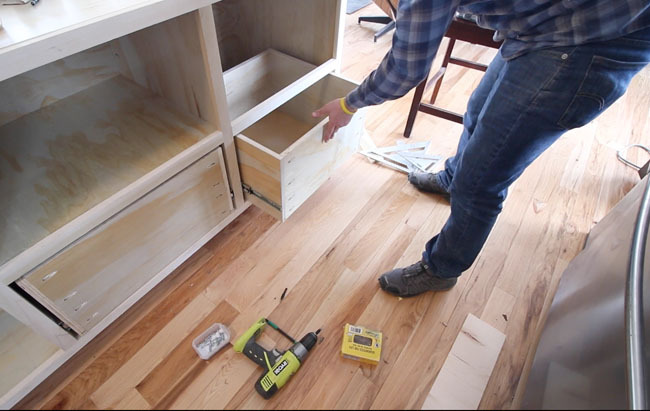 Once the drawers have been added, you can mount the drawer fronts by measuring the overhang the drawer front will have from the front drawer side. Mark from the sides and top and attach the face using two to four screws depending on drawer size. Mount the hinges onto the doors. I like to use the concealed hinge jig by Kreg for this, it makes the process painless and straight forward. 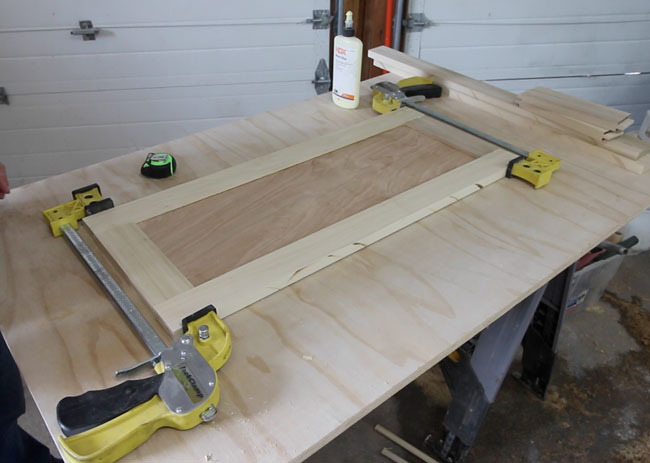 I used 1 and 1/4 overlay hinges. 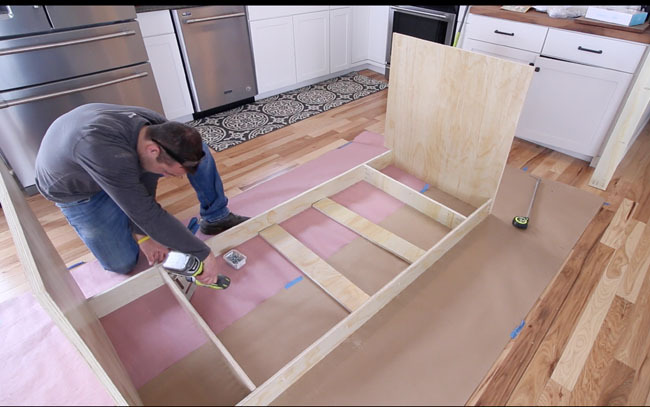 Once you've installed all the drawers and doors to make sure they fit correctly, we can move onto the painting process. 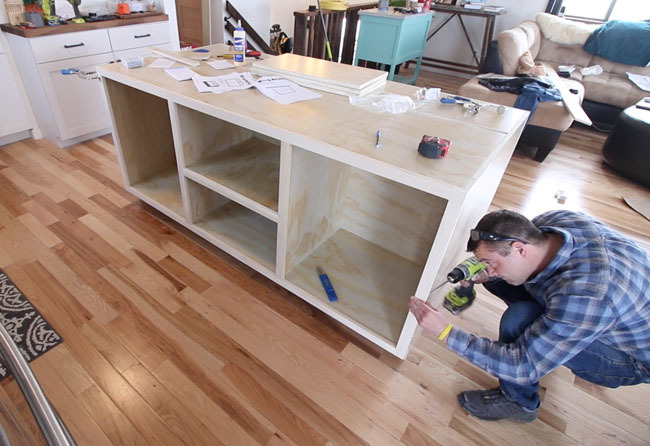 Remove all the drawers and doors so you can paint the face frame, doors, and drawer fronts. Tape around the face frame. 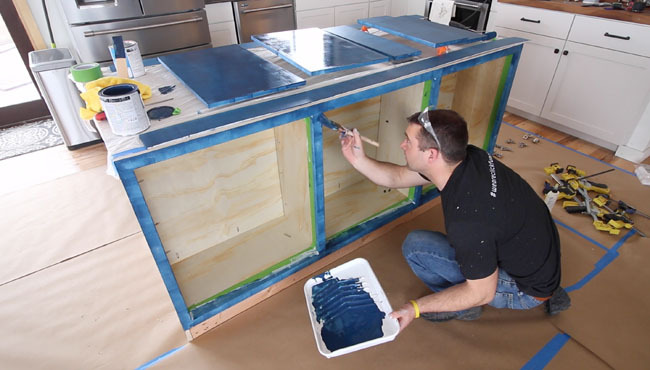 We applied a cabinet grade primer and paint with foam rollers. I sanded between a few of the coats to smooth things out. Let the paint dry according to the manufacturers instructions. Then mount the drawers, doors, and hardware. We used modern nickel pipe handles on both the drawers and doors. To get the waterfall effect for the countertop we will use a concrete overlay product. 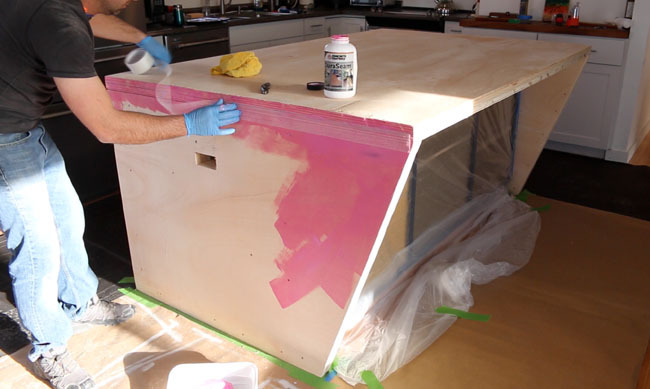 This is a DIY-friendly process that will create a much lighter concrete countertop. Originally, I planned for the sides to be rectangles. However, it looked a bit blocky for my kitchen space and so I decided to cut the panels at an angle. It turned out looking really cool and I haven't seen anything like it. I sandwiched three pieces of plywood together that were slightly less than 3/4 inches in thickness. The total of the combined panels put together came a little shy of 2 1/4 inches. The panels are connected to each other using wood glue and screws. We used three layers of plywood on top as well. We alternated where the seam was on each layer to maximize strength. The side seams were covered with mesh tape to prevent cracking. There was one seam on top as well. I used mesh tape to cover it. The pink material I rolled on is a bonding agent. It helps the concrete overlay bond to the plywood. 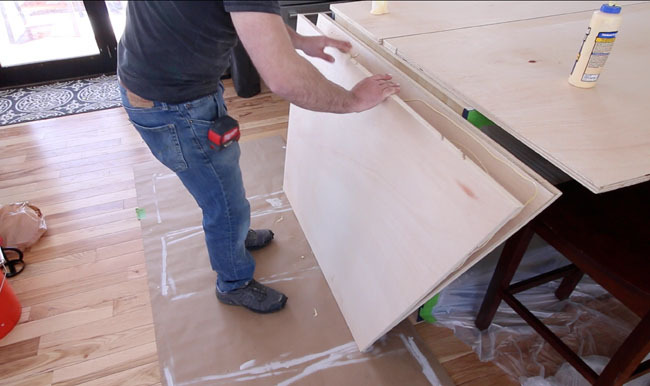 If your countertop is 48 inches or less in depth you will not have to deal with a seam on top. There are quite a few companies that make concrete overlay products. I'd recommend calling a local concrete supplier in your area to see what types they carry. This is often times cheaper than ordering online since concrete is so heavy. My concrete overlay supplies totaled about $280 when ordered online. This does not include the plywood that I bought locally. The first concrete overlay was white and was somewhat of a scratch coat. Apply the material to all surfaces and get it as smooth as you can. This is a more corse mixture than your final micro topping. Let the rough grade micro topping dry overnight. Use a mason rub brick to sand rough areas and to remove high spots. Next, mix up the smooth microtopping. I added some grey concrete coloring to give it a darker color. The manufacturer recommends about 6 coats of the smooth micro topping. Sand between coats using 220 - 400 grit sandpaper. Apply a food-safe water-based concrete sealer to the concrete once complete. 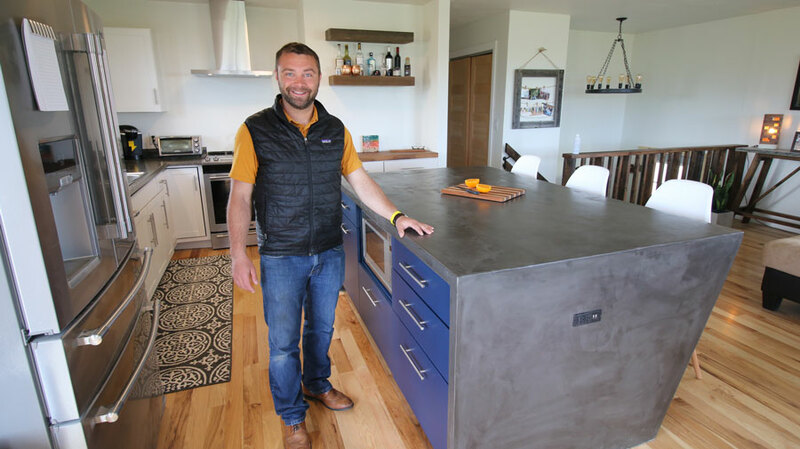 Enjoy your new modern concrete countertop! Remember to check out the Maytag appliances featured in this renovation if you are in the market for new laundry or kitchen appliances! And don't forget that May is Maytag Month! The brand is offering powerful deals from May 3 - June 6 on kitchen and laundry appliances, so make sure to visit here fore more details.